The Isle of Oronsay, locally sometimes referred to as Oransay, lies south of Colonsay and is owned by an American Lady. She has an agricultural agreement with the RSPB who are responsible for the wildlife management and the running of the farm. 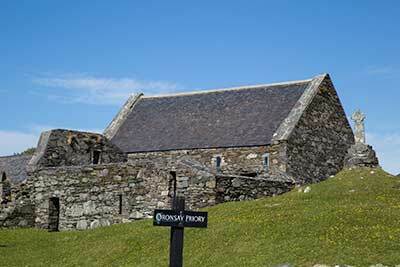 The “Big House” where the American Lady lives when she is over, is located next to the Farm and the Oronsay Priory. There are only a few resident people on Oronsay and their lives are “ruled by the tides” as Oronsay can only be reached at low tide crossing the Strand. The Strand is a sand and mud flat area which almost dries up at low tide and divides Colonsay from Oronsay. There used to be a standing cross halfway between the two islands, a so called Sanctuary Cross, for those escaping the law on Colonsay could claim sanctuary of the Priory if they reached the cross before being caught. It has been replaced by a cross shaped arrangements of stones. To the east from The Strand, right between Oronsay and Colonsay, is a beautiful beach and dune area with great views towards Jura and Islay. It is believed that Oronsay has its name from St Oran, the founder of the original Oronsay Priory in 563, but it could also come from the Old Norse “island of the ebb tide”. The Mesolithic hunter-gathering population which occupied the area following the most recent ice-age seems to have had the tiny island of Oransay at the heart of its way of life – for 1,500 years and more it seems that Oransay provided a centre for seasonal visits, for feasting and – presumably – matchmaking and other social and intellectual exchange. Currently Oronsay has a population of around five to six people. The highest point of Oronsay is Beinn Orasaigh with a height of 93m. The skerries surrounding Eilean nan Ron (Ron is Gaelic for Seal), to the south-east of Oronsay, are an important breeding ground for Grey Seals. Their numbers can be as much as a thousand in the Autumn. Also chough and the secretive corncrake with its distintive call are present on Oronsay as well as on Colonsay. When the tide is favourable you can easily cross The Strand although good footwear, or barefoot, is adviced as there are always areas where a few to sometimes 10cm of water resides. At the end of the official road, at the north end of The Strand, is a small parking space where you can leave your bike or vehicle. The walk to Oronsay is about a mile, to the farm and Oronsay Priory it’s about 2.5 miles. Make sure when you do this to check the tides. The Post Office in Scalasaig, where the ferry arrives, know the exact times when the tides go out and come back in, allowing you to make the trip and return safely on Colonsay with dry(ish) feet. The phone number for the shop, next to the post office, is 01951 200265. Please note that there are no facilities for tourists/visitors on Oronsay and there is also, usually, no mobile phone reception, so make sure to check tides before you go! Both the RSPB and the owner are very keen to protect the island. Please treat this nature reserve with care and respect! The walk to Oronsay Priory from the south end of the The Strand is beautiful and offers stunning views towards the Isles of Jura and Islay as well as to the low lying skerries to the south-west as soon as you have crossed the hill. The flat area on your left is an old airstrip which is no longer in use. Following the track the first building you’ll see is the white farmhouse, after that a cottage and the Priory itself are visible. The grounds of the priory as well as the farm-buildings and cottage are all in an immaculate state as the owners put in a lot of money to keep the place in a perfect state. Note the pine tree on the drive to the farm yard! 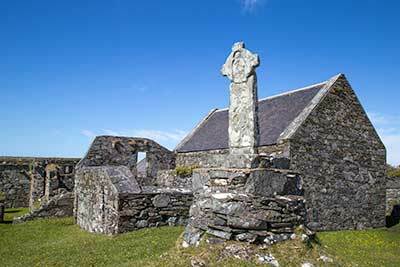 It is said that St. Columba (521-597) visited Oronsay to establish a monastery, leaving it for Iona when he realised he could still see Ireland from the island, but there is no evidence to support this. Oronsay priory was founded by the Augustinians in the early 14th century and became an important religious centre for the islands and Argyll over the next two hundred years. Dedicated to St. Oran, the presence of the Priory gave Oronsay much influence during the time when the Lordship of the Isles was an important political factor in Scottish history. Not only the grounds but also the priory buildings are in a relatively good state. For two centuries the MacNeill family made running repairs to the buildings, so the weather has been the only cause of damage leaving the buildings in remarkable condition. It’s an amazing experience to wander around the grounds of the priory and to admire all the details inside and outside the buildings. 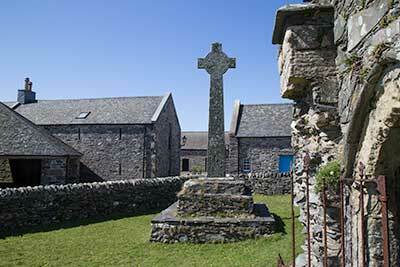 The site of the Oronsay Priory has two crosses. The little cross directly ahead when you enter the grounds, and the great cross to your left. The latter was carved according to the school of Iona by Mael-Sechlainn O Guind and has a resemblance with the Kilchoman Cross on Islay. 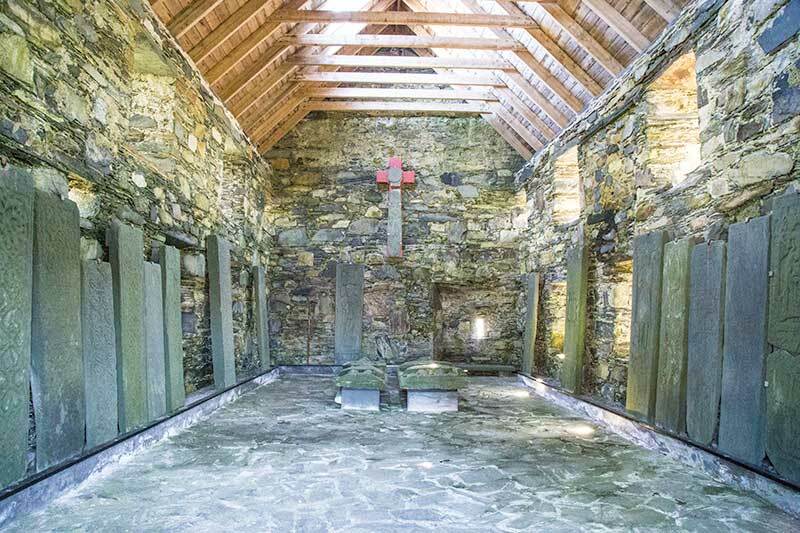 Soon after 1500, Canon Celestinus of Oronsay had directed restoration work on the Priory, including the rebuilding of the cloister, it was Malcolm MacDuffie who had commissioned the Great Cross. 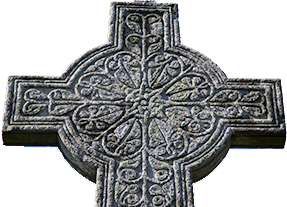 It is believed that the little cross could be centuries older than the great cross. There is a wealth of grave slabs to be found in the Priors House, at the back of the priory. Make sure to take the time for your visit, to enjoy the silence, listen to the singing birds and peacocks calling and let yourself be transferred to earlier times when Augustinian Monks lived, prayed and worked here.